"First of all," he tells him, "We've got Gibson in the lead." The director is surprised, "You got Mel Gibson?" "Well, no," the Producer responds, "we got Marvin Gibson, he's a distant cousin who lives in Queens, but he's very up and coming. And besides, we've also got Redford." "You got Robert Redford?" the director asks. "No, we got Jeremy Redford, but he's very talented and has lots of acting experience from years of dinner theater. 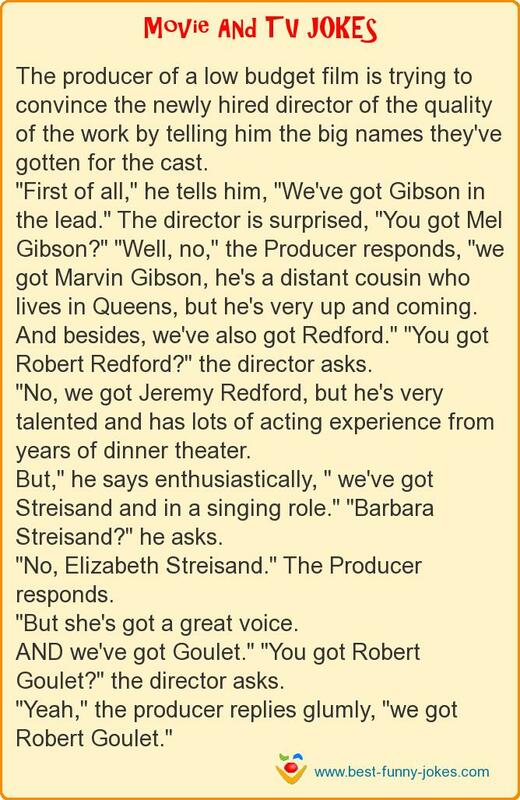 But," he says enthusiastically, " we've got Streisand and in a singing role." "Barbara Streisand?" he asks. "No, Elizabeth Streisand." The Producer responds. "But she's got a great voice. AND we've got Goulet." "You got Robert Goulet?" the director asks.